The BIGGEST Mass gainer in the World! When's the last time you thought to yourself, "I'd like to bust my @SS in the gym, struggle to eat enough food, and NOT gain a single pound of muscle?" That would be never, right? Of course! And that's exactly why if you're a hardgainer struggling to eat enough calories and build the insane size you want, you need to get on Mass Muscle Gainer™ today. Pound-for-pound...and there are 20 BIG ONES inside... Mass Muscle Gainer is the best VALUE, highest QUALITY, and BIGGEST Weight Gainer in the World. Every serving is packed with 1,000 + mass building calories, 60 grams of premium time-released protein, over 44 grams of amino acids, over 5 grams of Creatine Monohydrate and BCAAs, over 27 grams of Glycine, Platinum CarboClean™ carbohydrates, and so much more! Imagine knowing that every second, every minute, and every hour, your body is growing bigger and Bigger and BIGGER. To get BIG, your muscles need protein around the clock. That's why Mass Muscle Gainer supplies 60 massive grams of Platinum Pro Time Released Protein™. Ultra-pure, premium grade proteins such as Whey Protein Isolate, Whey Protein Concentrate, Micellar Casein, and Milk Protein Isolate. It's the perfect combination of fast, intermediate, and slow releasing proteins to encourage rapid muscle growth for up to 8 rock-solid hours. Get BIG - Not Fat. Anyone who's bulking up would give just about anything to stay lean, wouldn't you agree? Your choice in carbohydrates and fats will either make or break your physique. That's why Mass Muscle Gainer utilizes Platinum CarboClean...the cleanest, highest quality, time-released carbohydrates to increase & sustain energy, rapidly refuel muscles, promote faster growth, and discourage fat gain by strategically augmenting the anabolic insulin response. PLUS - every serving is loaded with Medium Chain Triglycerides (MCTs), Essential Fatty Acids (EFAs), and Conjugated Linoleic Acid (CLA) - the BEST and healthiest fats for promoting the shreds and fighting the bulge. Did you know higher amounts of L-Glycine can naturally increases your body's most powerful mass building and fat shredding hormone? That's right. We're talking about Human Growth Hormone. Every serving of Mass Muscle Gainer delivers over 27 grams of pure L-Glycine. That's more than 4x the amount scientifically proven to send HGH levels through the roof! Why so much? Because the extra Glycine may also help improve nutrient absorption and prevent muscle protein breakdown, too. Buy Elite Labs Mass Muscle Gainer from Fitness Market and save! With our efficient dispatching and quick delivery throughout Australia, Elite Labs Mass Muscle Gainer can be yours sooner. 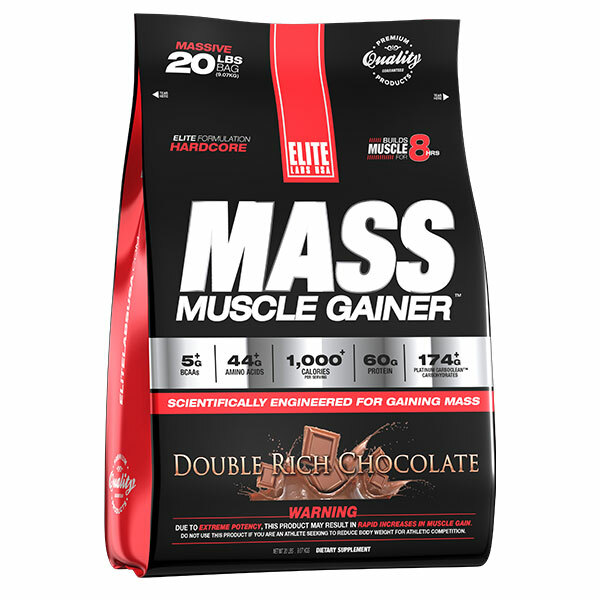 Below you can rate and add reviews for Elite Labs Mass Muscle Gainer.